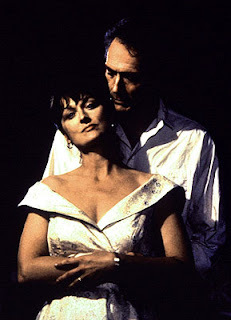 Bits and bobs: The Bridges of Madison County. I hope this finds you well. I don't know when you'll receive it. Sometime after I'm gone. I'm sixty-five now, and it's been thirteen years ago today that we met when I came up your lane looking for directions. I'm gambling that this package won't upset your life in any way. I just couldn't bear to think of the cameras sitting in a secondhand case in a camera store or in some stranger's hands. They'll be in pretty rough shape by the time you get them. But, I have no one else to leave them to, and I apologize for putting you at risk by sending them to you. I was on the road almost constantly from1965 to 1975. Just to remove some of the temptation to call you or come for you, a temptation I have virtually every waking moment of my life, l took all of the overseas assignments I could find. There have been times, many of them, when I've said, "The hell with it. I'm going to Win- terset, Iowa, and, whatever the cost, take Francesca away with me." But I remember your words, and I respect your feelings. Maybe you were right; I just don't know. I do know that driving out of your lane that hot Friday morning was the hardest thing I've ever done or will ever do. In fact, I doubt if few men have ever done anything more difficult than that. I left National Geographic in 1975 and have been devoting the remainder of my shooting years mostly to things of my own choosing, picking up a little work where I can get it, local or regional stuff that keeps me away only a few days at a time. It's been tough financially, but I get along. I always do. Much of my work is around Puget Sound. I like it that way. It seems as men get older they turn toward the water. Oh, yes, l have a dog now, a golden retriever. I call him "Highway," and he travels with me most of the time, head hanging out the window, looking for good shots. In 1972, I fell down a cliff in Maine, in Acadia National Park, and broke my ankle. The chain and medallion got torn off in the fall. Fortunately they landed close by. I found them again, and a jeweler mended the chain. I live with dust on my heart. That's about as well as I can put it. There were women before you, a few, but none after. I made no conscious pledge to celibacy; I'm just not interested. I once watched a Canada goose whose mate had been shot by hunters. They mate for life, you know. The gander circled the pond for days, and more days after that. When I last saw him, he was swimming alone through the wild rice, still looking. I suppose that analogy is a little too obvious for literary tastes, but it's pretty much the way I feel. In my imagination, on foggy mornings or afternoons with the sun bouncing off northwest water, I try to think of where you might be in your life and what you might be doing as I'm thinking of you. Nothing complicated--- going out to your garden, sitting on your front porch swing, standing at the sink in your kitchen. Things like that. I remember everything. How you smelled, how you tasted like the summer. The feel of your skin against mine, and the sound of your whispers as I loved you. Robert Penn Warren once used the phrase"a world that seems to be God-abandoned." Not bad, pretty close to how I feel some of the time. But I cannot live that way always. When those feelings become too strong, I load Harry and go down the road with Highway for a few days. I don't like feeling sorry for myself. That's not who I am. And most of the time I don't feel that way. Instead, I am grateful for having at least found you. We could have flashed by one another like two pieces of cosmic dust. God or the universe or whatever one chooses to label the great systems of balance and order does not recognize Earth-time. To the universe, four days is no different than four billion light years. I try to keep that in mind. But, I am, after all, a man. And all the philosophic rationalizations I can conjure up do not keep me from wanting you, every day, every moment, the merciless wail of time, of time I can never spend with you, deep within my head. I love you, profoundly and completely. And I always will. P. S., I put another new engine in Harry last summer, and he's doing fine. Espero que ésta te encuentre bien. No sé cuándo recibirás esta carta. Algún tiempo después de mi partida. Tengo sesenta y cinco años, y hoy hace trece que nos conocimos, cuando entré en tu sendero para pedir indicaciones. Espero que este paquete no perturbe tu vida en modo alguno. No podría soportar pensar que las cámaras queden en estuches gastados en algún negocio de segunda mano, o en poder de un desconocido. Estarán bastante estropeadas cuando te lleguen. Pero no tengo a quien dejárselas, y te ruego que me perdones por ponerte en riesgo enviándotelas. Entre 1965 y 1975 estuve casi todo el tiempo viajando. Para alejar la tentación de llamarte o ir a verte, una tentación que tengo virtualmente en todos mis momentos de vigilia. Acepté todas las misiones que pude fuera del país. A veces, muchas veces, me dije: "Al diablo, me voy a Winterset. Iowa, y me llevo a Francesca conmigo a cualquier costo". Pero recuerdo tus palabras, y respeto tus sentimientos. Tal vez tengas razón; no lo sé. Lo que sé es que salir de tu sendero esa calurosa mañana de un viernes fue lo más duro que me tocó hacer en la vida. En realidad dudo de que muchos hombres hayan hecho jamás algo tan difícil. Dejé el National Geographic en 1975 y dediqué el resto de mis años de fotógrafo a cosas elegidas por mí, haciendo algún trabajo donde lo encontraba, temas locales o regionales que sólo me obligan a estar fuera por unos días cada vez. Desde el punto de vista financiero es duro, pero me las arreglo. Siempre me las he arreglado. Gran parte de mi trabajo gira alrededor de Puget Sound, y eso me gusta. Parece que cuando los hombres envejecen se acercan al agua. Ahora tengo un perro, un perdiguero dorado. Lo llamo "Camino", y viaja conmigo casi todo el tiempo, sacando la cabeza por la ventanilla, buscando buenas presas. En el setenta y dos me caí de un acantilado en Maine, en el parque nacional de Acadia, y me fracturé un tobillo. Con la caída se rompieron la cadena y el medallón. Afortunadamente cayeron cerca. Los encontré y mandé reparar la cadena a un joyero. Vivo con el corazón cubierto de polvo. Esa es la mejor manera en que puedo expresarlo. Hubo mujeres antes de ti, algunas, pero después de ti ninguna. No hice ningún voto de celibato; sencillamente no me interesan. Una vez vi un ganso en Canadá a quien unos cazadores le habían matado la pareja. Sabes que se aparean para toda la vida. El ganso anduvo en círculos alrededor del estanque durante muchos días después de lo sucedido. Cuando lo vi por última vez nadaba solo en medio del arroz silvestre, siempre buscando. Supongo que la analogía es demasiado obvia para el gusto literario, pero es así como me siento. En mi imaginación, en mañanas neblinosas o en tardes en que el sol se pone sobre las aguas al noroeste, trato de pensar qué puede ser de tu vida y qué estarás haciendo mientras pienso en ti. Nada complicado... salir al jardín, sentarte en la hamaca del porche, estar de pie ante la pileta de la cocina. Cosas así. Recuerdo todo. Tu olor, tu sabor de verano. La sensación de tu piel contra la mía, tus susurros cuando te amaba. Una vez Robert Penn Warren usó esta frase: "... un mundo que parece abandonado de Dios...". No está mal, se parece bastante a lo que siento a veces. Pero no puedo vivir siempre así. Cuando esos sentimientos se hacen demasiado intensos, cargo las cosas en Harry y me voy de viaje por unos días con Camino. No me gusta tenerme lástima. No soy de esa clase de hombre. Y la mayor parte del tiempo no me siento así. En cambio me siento agradecido por haberte encontrado. Podríamos haber pasado uno junto al otro sin percibirnos, como dos porciones de polvo cósmico. Dios o el universo, o lo que uno elija para nombrar los grandes sistemas de equilibrio y orden, no reconoce el tiempo terrestre. Para el universo, cuatro días no es distinto de cuatro mil millones de años luz. Yo trato de tenerlo siempre presente. Pero, al fin y al cabo, no soy más que un hombre.Y todas las elucubraciones filosóficas que pueda conjurar no me salvan de desearte, todos los días, a cada momento ni del despiadado gemido del tiempo, el tiempo que nunca puedo pasar contigo, dentro de mi cabeza. Te amo profundamente, totalmente. Y será siempre así. P.S. : El verano pasado le puse un motor nuevo a Harry. Anda muy bien. I think this touching letter summarises the intense, lasting love story in “The Bridges Of Madison County” and I like especially the fact that the characters are “mature” and not a couple of 20 year-olds. It was a surprising “word of mouth” best-seller book in the 1990s about the story of Francesca Johnson, a 45 year-old Iowa farm wife who meets Robert Kincaid, 52, a “National Geographic” photographer while her family is away at the Illinois State Fair. 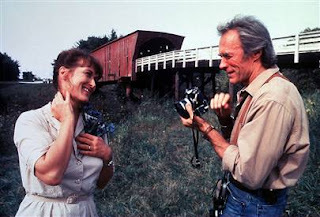 “The Bridges of Madison County” is set in mid-1960s when Robert Kincaid comes to Iowa to take pictures of historic rustic covered bridges for a National Geographic magazine article. Since the rural roads to Roseman Bridge are not clearly marked, he asked Francesca for directions and she offered to accompany him. Kincaid takes various shots of the bridge at a distance, because he is losing the light he needs and he decides to return the next day. Back at home she invites him for dinner and he helps her prepare the vegetables for the meal. They share a few beers, exchange life stories and take a short walk after dinner. The evening ends when Kincaid leaves as he needs to rise early for the next day’s shoot. But Francesca drives to the bridge again that night and tacks up a note where she knows Kincaid will find it. It’s an invitation to dinner the following evening. At dinner the next evening they realize they have fallen in love and their intense, short-lived love affair begins. During their four days together, they have much intimacy and tender conversation. They are joined in an experience of uncommon and stunning beauty, an experience that will haunt them forever. He asks her to come away with him but Francesca realizes she cannot leave her family because of her sense of responsibility to them. She cannot abandon them, “They would not survive the talk”, she could never bring such pain and humiliation to her family. So, the two lovers return to their previous lives with thoughts of what might have been. They will never see each other again, they have only a couple of written contact over the years. After Kincaid has died, a package reaches Francesca that contains his cameras, the medallion she had given him, the old note she had tacked to the bridge and a letter that informs her that Kincaid has passed away. She also learns that his cremated remains were scattered at the Roseman Bridge. By this time Francesca’s husband has passed away and she lives out her days alone remembering her time with Robert. One day, at the age of 69, she is found dead. She has left instructions for her ashes to be scattered at Roseman Bridge. This puzzles her two grown children who had planned to bury her alongside their father. “The Bridges of Madison County” is a beautifully written book, maybe overly sentimental but it has a memorable magical read. It’s one of the most romantic, stirring ta les of true love I’ve ever read, it has captured my imagination and support the same as Dr. Zhivago, Romeo and Juliet, Casablanca film and countless others. 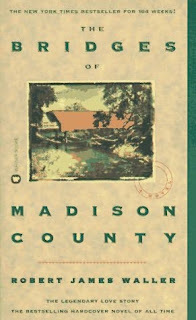 Even if the book is controversial with people divided into fans and foes of the story, regarding it as romance, literature or an adult fairy tale, “The Bridges of Madison County” holds a fascination for people because of the popular themes it explores: love, passion, opportunity, regret, loyalty, consequence and responsibility. This book was followed in 1995 by a well-received Hollywood film of the same name starring Meryl Streep and Clint Eastwood. • It was a great film. Maybe a bit cloying, sickly sweet. • Clint Eastwood is fantastic, and Merl Streep too, of course. Beautiful book ; beautiful blog ; whenever I read this letter ..I get stuck !!!! No one other than who's truely loved and lost his love ....can understand this . I love this movie so much, I want to take a trip to Winterset and all the places Robert and Francesca visited in those four days.